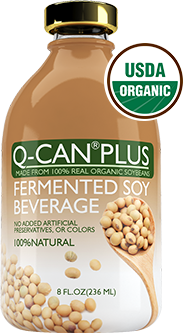 Q-CAN Plus® is a fermented soybean beverage that is made with real USDA certified Organic Soybeans. The fermentation process breaks down beneficial soybean nutrients into a nutritious beverage and a part of a balanced diet. Q-CAN® Plus daily health is the perfect choice. 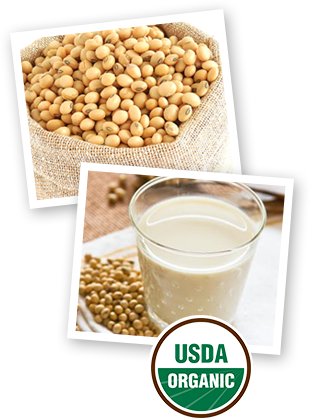 The amino acids in fermented soy are a natural energy source and help your body break down food, repair tissue, and grow. Fermented soy is not only easy to digest, it promotes overall digestion. Loaded with naturally occurring fatty acids, isoflavones, and easily digestible protein, it will leave you feeling ready to take on whatever challenges life throws your way. Adding fermented soy to your diet through Q-CAN® Plus is a great way to get a head start on a healthy new beginning for your body.